One of the runners who benefited from that special something was American Andrew Epperson. An assistant coach at Colorado State University, Epperson came to Beppu-Oita with a 2:16:49 best off a 1:03:17 half marathon PB two weeks ago in Houston. After going out with the massive lead pack at just a shade over 3:00/km for the first 5 km Epperson found himself alone. 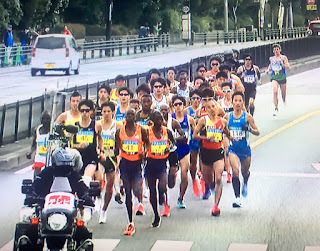 Like Canada’s Reid Coolsaet in Fukuoka a few years back Epperson spent the rest of the race running by himself in sight of the leaders, picking off the stragglers one by one as the lead group’s fast pace knocked them out. Epperson went through halfway in 1:04:38 and was still on 2:09:52 pace at 30 km before faltering. Ultimately he walked away with a 2:13:11, the best time so far this year by an American man and one that, like the three Japanese men who broke 2:10, qualified him for his country’s 2020 Olympic Trials. Post-race Epperson talked to JRN about his race and experience. This was an incredible experience for me as it was my first international race. I was fortunate enough to be invited through contacts I made at the Chicago Marathon and was with Koichiro Endo for the duration of my stay. Mr. Endo did a wonderful job arranging transportation, taking the time to give me a course tour after the technical meeting, and finding delicious meals during my stay! The thought process when I found out about the opportunity in Japan was to run well. Chicago left a bad taste in my mouth; I felt it did not properly reflect my training so I was anxious to make amends. I recovered well after Chicago and when I committed to Beppu-Oita I had also committed to the half in Houston, so the scheduling was perfect. I had a small notion of running 2:13 the day before the race but ultimately I wanted to come back to the States with the 2:15:00 U.S. Olympic Trials A-Standard. There is no difference in funding from the Atlanta Track Club whether you run 2:06 or 2:14:59, and with no sponsor I would be short-sighted if heading into the race my goal was 2:12:00 or bust. My result from Houston was both encouraging and a sign of what was to come. 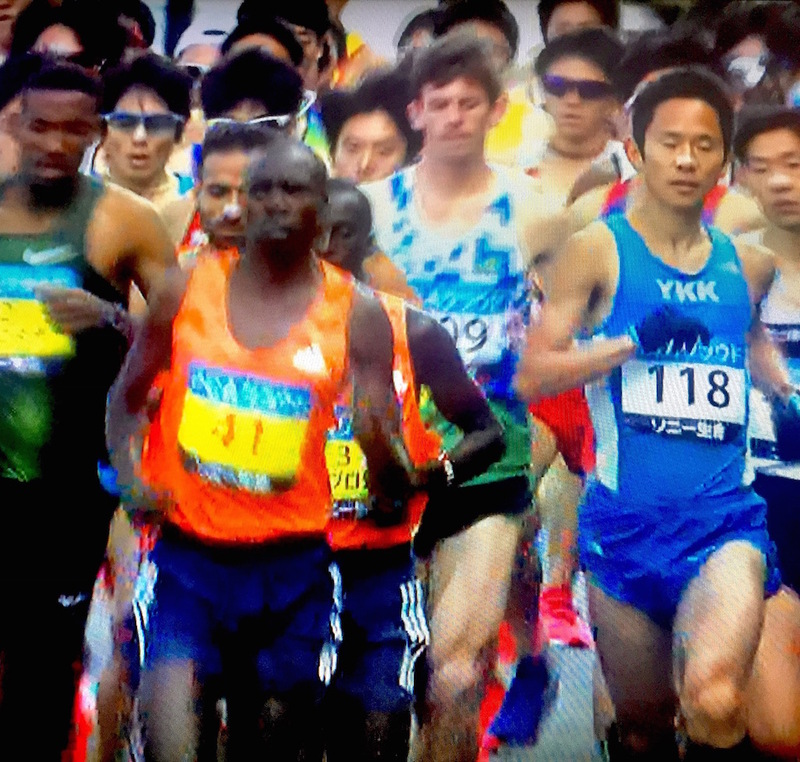 I went through 5k there with the top Americans, including my training partner Jerrell Mock who debuted in 62:15, but backed off as I didn't want to put myself in a hole for Beppu-Oita. I then ran on my own, picking runners off that fell out of that group, and came away with a big 47-second PR. After Houston my coach Art Siemers and I came up with the plan to go out in 67-67:30 in Beppu-Oita and pick it up the second half. With instructions coming from the tech meeting saying that the 1st group would be going out at course record pace and the 2nd group at 2:10 pace I was mentally prepared to be the sole member of the "3rd" group. My race plan was to work on my own and wait for runners to fall back. 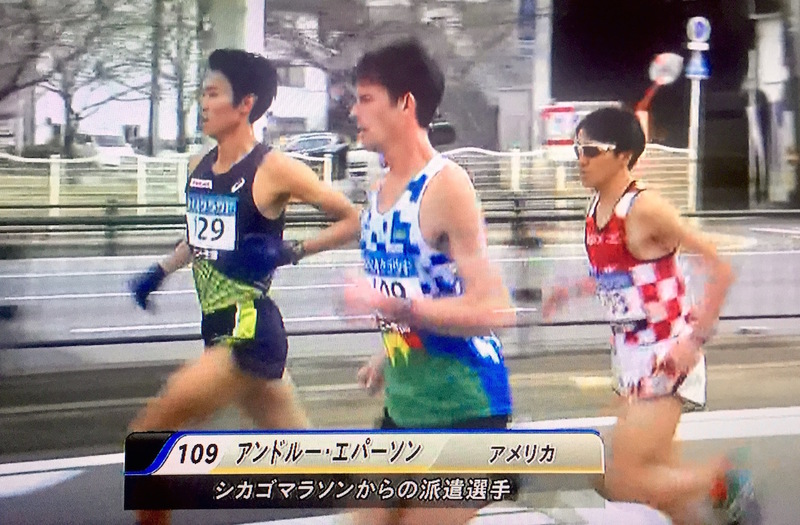 One of these races I'll work with a group and will enjoy it, but I was not afraid to work on my own in Beppu-Oita. 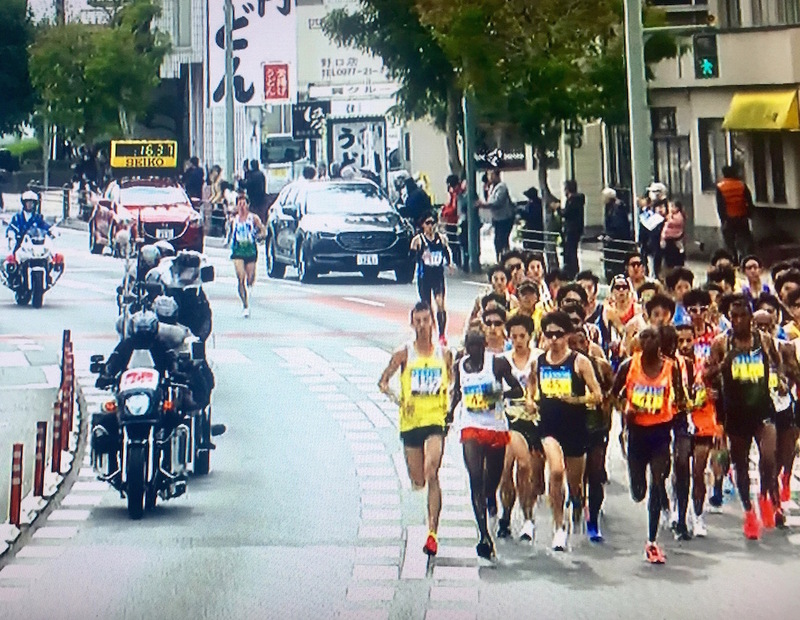 I knew with the first 10k in Beppu-Oita being net downhill I would need to be cautious early and did my best not to start too fast. When the field went out hard I did my best to "slow" down and wait, but the atmosphere and energy lining the streets was incredible and before I knew it I was clicking off 3 minute kilometers. Given how large the 1st group was I honestly thought I was in the 2nd group. I then had to try and calm my panicked nerves after checking my watch the first 2k of the race. I had the mental image from any action movie where the hero continuously pounds his foot into the brakes of a speeding vehicle only to find that they have been cut. I backed off and tried to settle in but then I began catching runners and not worrying about splits. I hit halfway in 64:38 and had a small panic attack, but it quickly went away because I could still see the lead car/pack and people were still coming back to me. It was a weird mixture of panic and confidence, and when you keep the lead car in sight for 33k of a prestigious marathon something special is bound to happen. I pushed hard from 20-25k knowing that it was the most technical and windy part of the course, taking the tangents as aggressively as possible. Then, at 30k, I began losing sight of the lead group and fewer people were dropping off, and then I started to slow down myself. I remember hitting 36k and thinking, "Not much further, be tough," and did my best not to slow down any more. I only got passed by 2 people around 35k, so I feel like I went out in a proper position despite being faster than instructed. The energy in the streets was even greater over the last 3k and it helped me push hard again. Finishing on the track was a unique experience, and when I looked at the clock with 200m to go I knew I was about to do something special. I came with a goal of running the Trials A-standard and knew a lot of things would need to come together in order for that to happen. I was fortunate in training to remain healthy and strong, the weather during the race was fantastic, and the course was lightning fast. It was a race I will never forget, and I walk away with a three and a half minute personal best and a new sense of confidence in myself. If you had told me before the race that I would go out, through 30k of the marathon, 30 seconds off my old half PR I would have laughed and guessed that my finishing time would be closer to 2:18. After any personal best, every athlete will say they could have run faster. I am certainly not going to deny that, especially with how ludicrous my first half/30k were, but I also have a year to keep doing what I've been doing. The American marathon field is in an interesting state right now and my goal moving forward is to remain consistent in training. After all, my training before the 2018 Chicago Marathon and Beppu-Oita were almost identical and I ran four minutes faster this past weekend. Not having a shoe malfunction certainly helped, but staying consistent and healthy have been my biggest allies as I continue to improve. My only regret is that I could not extend my stay. I would love to explore Japan more and look forward to coming back in the future; whether it's through running or vacation. I want to thank Mr. Endo and the rest of the Beppu-Oita race staff for an excellent experience and a world-class event. Thank you for posting/reporting this! Andrew is a great young guy, modest and hard working.